An advanced 8-channel audio processor for TV applications based on Jünger’s flexible D*AP8 processing platform, the TAP EDITION is designed to ensure consistency of loudness and sonic “character” across multiple programme sources. Jünger’s Level Magic II™ algorithm intelligently controls loudness without adding undesirable artefacts, while Jünger’s Spectral Signature process sonically matches programme material to a pre-determined sound “style” reference. Suitable for mono, stereo or surround operation; rack-mounting (1U), with removable front panel for highly flexible local or remote control. The D*AP8 TAP EDITION, based on the D*AP8 processing platform, provides a powerful set of audio tools for broadcast facilities of all types. It incorporates both Jünger’s well-established Level Magic II adaptive loudness algorithm and the Spectral Signature dynamic filter process. This combination provides the broadcaster with greater consistency of audio across multiple programme sources than was previously possible, both in terms of loudness management and the actual sonic “character” of the programme sound. In practice, the TAP EDITION may be used to transparently manage the disparate and sometimes unpredictable levels that are delivered to the transmission chain, or as the “safe pair of hands” looking after the overall programme loudness and level (particularly relevant on OBs), leaving the sound supervisor free for the creative process of mixing live mics and other sources. 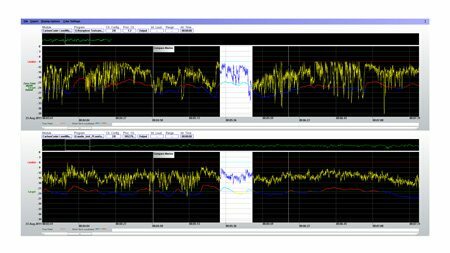 Level Magic II™ addresses the common problem of significant – and often disturbing – changes of loudness occurring when switching between programme sources, particularly during unattended operation. The algorithm ensures that program levels remain within predetermined tolerances without any colouration, pumping, breathing, distortion or modulation artefacts, no matter what the programme source is. Loudness logging is possible with the addition of Jünger’s optional J*AM LoudnessLogger™ software application. Spectral Signature™ is a dynamic filtering technique which permits the analysis of a known sample of programme which is used as a “reference”. The TAP EDITION adjusts the spectral content of all programme material to match this reference as closely as possible, ensuring that all audio output has a similar sonic character. This entirely automatic process removes the necessity for an audio specialist to apply equalisation to the material. Dolby® capability may be added with the addition of one of several internal modules: a Dolby® E decoder may be fitted, which also caters for Dolby® Digital and Dolby® Digital Plus formats. Two encoder modules are also available, one generates a Dolby® E stream, the other covers Dolby® Digital, Dolby® Digital Plus, plus AAC and HE-AAC audio formats. The TAP EDITION is designed to integrate cleanly into any broadcast facility. Standard I/O is via AES3-id, but the unit may be ordered with optional SDI (SD/HD/3G), AES3 or analogue I/O cards if wished. The operator may set the unit to be transparent to Dolby® E and Dolby® Digital bitstreams if desired. Several remote control options are provided, including a GUI via an external browser. This is the primary control method and allows full control and configuration of all unit parameters through a comprehensive set of web pages. The TAP EDITION is also compatible with Ember+ for integration into existing network control systems using these protocols. For hardware remote control, the unit has a removable front panel, allowing the controls to be mounted in a location which is both suitable for the operator and occupies minimum space. One control panel may remotely control several processors; alternatively multiple panels may be installed in different locations if needed. Further remote control options are available in the form of parallel GPI/O and RS-422 serial ports.